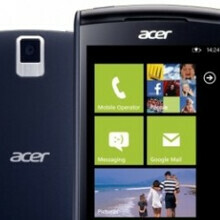 Acer is reportedly getting ready to re-enter the Windows Phone market sometime next year. According to Focus Taiwan and “sources familiar with the project,” the Taiwanese company is planning to launch at least one handset based on Windows, possibly starting with an entry-level, or mid-range model. While Focus Taiwan doesn’t have more details on this, Indian website Gizbot reports that Acer’s first new Windows-based smartphone could be released in the first half of 2015. If that’s the case, it means the device won’t be running Windows 10 out of the box, since Microsoft isn’t going to launch this new version of the OS before late summer / early fall. Acer’s last Windows Phone device was the Allegro W4 (pictured above), a 3.6-inch handset introduced in 2011 with Windows Phone 7.5 Mango on board. Earlier this year, not long after adding lots of new Windows Phone hardware partners, Microsoft completed the acquisition of Nokia’s devices and services unit - thus it’s now a smartphone maker itself. These facts may make it difficult for Acer to succeed with its alleged new Windows handsets. But we’ll see how things are going next year. hahaha agreed! we need a damn good quality windows phone, though im pretty happy with the 1520 right now.